I wish to take on this opportunity to thank you Madam Speaker and Honorable Members in approving my appointment as Prime Minister. I wish to also thank His Excellency the President for the trust and confidence in appointing me as Prime Minister. Let me take this opportunity to thank my predecessor, Ndugu Amama Mbabazi, who has served very well as Prime Minister of the Republic of Uganda for the last 3 years. As you well know, the duties of the Office of the Prime Minister are well defined. I will be focusing on implementation of the NRM (Movement) Manifesto, the National Development Plan and the coordination of Government programs as approved by Parliament. Our focus will be on implementation of the many infrastructural projects underway and we will continue to prioritize improved service delivery to the people. To that end, I wish to reiterate that it is our collective responsibility to ensure that our population access the essential services that they are duly entitled to such as health and education among others. In order to address the problem of poverty and youth unemployment, promotion of private sector investments and job creation must remain a top priority. We must also focus on modernization of agriculture, industrialization and value addition as key pillars of our transformation program. Let us intensify our collective effort to combat corruption, a vice that has plagued our society and still remains a challenge. Greater emphasis will be placed on accountability and transparency in managing public affairs. This is a responsibility of Government, the Opposition and of every Ugandan citizen. Our country has had a difficult history; one scarred with wars, disease and natural calamities, to which so many lives have been lost. Through struggle and sacrifice, Uganda has since emerged out of this difficult period and is now playing a vanguard role in promoting regional security and socio-economic development. As I take on this new responsibility, I take it on fully aware of the hard times, struggle and sacrifice that Ugandans have gone through, however, Our nation has also attained significant achievements, promising great opportunities and bright future. I call upon all honorable members of this this August house and our fellow citizens, to collectively consolidate these achievements as we work together in advancing Uganda’s transformation agenda. I thank you Madam Speaker, and I say this for God and my country. I do NOT believe in “Ugandan time”. Time is time; but annoyingly, some people respect it more for its word value than as a quantitative measure or for its numeric, measurable quality. Coming from this paradigm, my time spent in a European capital with busy business people the other week starkly refreshed my appreciation of time. The phrase ‘word value of time’ refers to the way people express time in order to appear organised, focussed and sensible. People at meetings tend to say things like, “Two minutes each, everybody, then we move to another issue…” then sit back to allow irrelevant verbiage to flow uncontrolled. Event managers and EmCees holding printed programmes in their hands as they run through events occasionally announce, “Three minutes; I’m giving speakers three minutes each…” then retreat to hover on the sidelines of long, winded speeches that seem to hypnotise everybody into occasionally clapping their hands. The ‘word value of time’ also accommodates this habit we have of setting appointments with straight faces and agreeing amongst ourselves, nodding wisely and pointing at wristwatches, things such as, “Ten o’clock? Yes, yes. Tomorrow at ten? Right. I’ll be there…”. The time agreed only matters during the few seconds that you mention it to each other as the agreed meeting time, and often the seriousness with which it is stated evaporates just as time itself does. 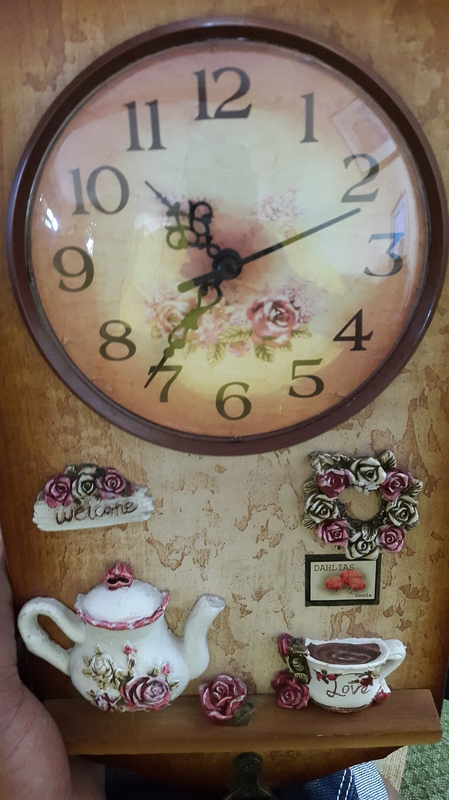 Come ten o’clock the next day, and both parties to the meeting arrangement are not only absent from the meeting venue but exchange no apologies for lateness and when they do converge, hours later, most times do not even raise the matter of lateness. “Better late than never!” they might laugh, which phrase I hate with utmost sincerity because whoever introduced it to my countrymen should have completed it with the appropriate ending (please suggest what this ending should be?) rather than create this compromise position that we have gripped on to as if it is a default position. My trip last week took me to a business convention in Amsterdam, the International Broadcasting Convention, where I was one of 55,000 attendees of the world’s biggest gathering of broadcasting people. Time is of such value in broadcasting that the world practically used to re-set their clocks to the pips at the top of the hour on BBC, played according to what the Observatory at Greenwich (the ‘G’ in GMT) read. Serious broadcasters are tested by their adherence to the time they set their programmes at; if your TV channel promises to air the news or your favourite programme at a certain hour, you should be able to set time according to when the programme begins – IF they are serious. Of course, this matters greatly in places where time actually means something; whereas for some people here, you could set an appointment for “Chicken Soup o’clock” or “A quarter to Yellow Paint” and it would mean much the same thing as any time value you indicate – anything. The busy business people in Amsterdam were not having any of that, and kept me amused right from the time I landed till I left them in their time-keeping bubble. The hotel shuttles were so on time that occasionally the driver sat idle and wait for EXACTLY the right half minute before reaching across to shut the door then engage gear using a thirty-second provision, before setting off on the dot. The trains were so exasperatingly well-run that even a five-minute delay was announced before it occurred. In fact, the first two times I insisted on asking the ticket sellers for exactly what markings or numbers I should expect to see on my appointed trains they were confounded because as far as they were concerned, all I needed to do was board the train that docked at the hour they stated, at the platform indicated, and I would be alright. Now, all those 55,000 people were there for business. Unlike exhibitions where people go in to buy cheap saucepans or building materials, this was a proper business set-up with conferences and meetings all scheduled and run on time. An exhibitor with 55,000 potential customers in one place needed to use time effectively; many had set their meetings weeks, even months ahead, to maximise their use of the five days there. A ten-minute meeting overlapping by two minutes presented a risk to the next scheduled appointment, and I kept noticing that some people would melt away to start the next meeting according to plan rather than allow the inexcusable type of build up that we see many times here when your midday appointment turns into an evening dinner. The earnest manner in which meetings, trains and phone calls were scheduled was extremely at odds with the way people I know tend to set meetings at “Between Ten and Eleven…”. That one-hour meeting start time still irritates me – I like having many options but those are 60 different options for a meeting start time! And that’s without factoring in the start of the meeting being when coffee and tea is poured out…or when some people get into their cars or onto boda-bodas to head to the meeting venue! The word value of time might have roots in the days when people were respected more if they owned watches, regardless of whether they knew how to read time or anything else; perhaps some people focussed more on the acquisition of the timepiece than on its use. The fact that we have almost as many mobile phones as people should make us more time conscious than most other nations – but we obviously don’t use the clock and alarm and stopwatch features as much as we use the Dialler, SMS and WhatsApp applications. If we did, with the number of meetings that we insist on holding – fundraising, organisation, business, management, drinking, hookup, fundraising – we’d hear more alarms going off than ringtones and music playbacks, and we would be much, much more organised on the whole! i am confused – should we not be buying Ugandan and promoting buy Ugandan? But even if I did find the time I would probably go down to Katwe or to one of the ICT hubs (which is what I am actually going to be doing today, with the guys from the ICTAU – ICT Association of Uganda) and do something to promote Buy Ugandan instead. Of course, the guys at the Private Sector Foundation of Uganda should have a rationale for hosting this event, and it might make sense but I would still question it strongly. Especially at THIS point in our lives, when everybody keeps talking about Africa Rising and what not. What I find even more confusing is the entry fee of Ushs10,000! 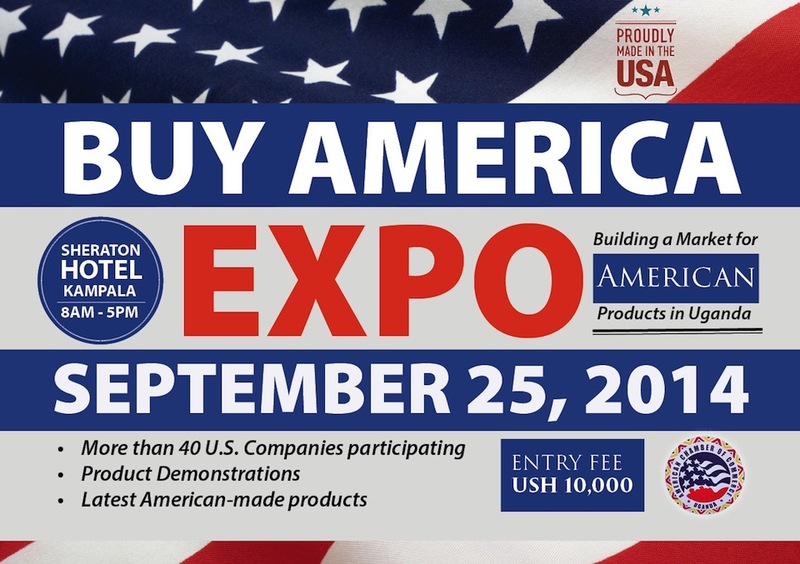 I kid you not – you are required to pay Ten Thousand Uganda Shillings in order to access this ‘Buy America Expo’. I need to pay Ushs10,000 to go into an expo that is “Building a Market for American Products in Uganda”? No, I am actually asking – Why? Hab’waki? Lwaki? Kwanini? And of course, that will not be surprising because that is exactly the attitude that America has built up over the years. Don’t get me wrong – America is a great country and can make for a good shopping and relaxation holiday, and they probably make good products as well. In fact, I shop for stuff from there quite often – just not anything that I can get made in Uganda or East Africa. A lot of what I buy from America, though, is actually made in China…but that’s another story altogether. I even support the event in its entirety because it makes sense for any country to do this – and I hope that the PSFU is doing this particular event in order to take notes and then go and do an even bigger one in America for Ugandan products! I am this close (the index finger almost touching the second finger but with a very small ka-gap in-between) to investing in a roadside carpentry workshop. I’m not planning on the type with shiny, Chinese imported furniture or second-hand stuff from Europe; neither am I pointing at those ones with furniture manufactured on uneven ground that wobble uncontrollably when you sit on the seats, or place drinks on the coffee table. I’m probably going to target one near my residence, where I recently made a series of startling discoveries in the midst of a frustrating project I brought onto myself. Fed up of dealing with artisans who have no sense of time, quality, reliability, dependability and all such other adjectives we somehow expect them to possess, I have this year sworn to engage in as many D-I-Y projects as possible. Considering how terribly wrong these artisans are at their jobs, I felt that even as a novice I could not do much worse. An opportunity presented itself when we needed to install mosquito nets on the children’s beds, and received a range of quotes that would only have made sense if we had been directors in the Eutaw Construction Company of Uganda or something. I walked over to a nearby roadside carpentry workshop and without disclosing the existence of beds to which I wanted to attach them, found a willing fellow to quote for just the bed poles I needed. He was a little confused at first but eventually got the point with my persistence. The fellow, who I later learned was called Issa, agreed to a minimal cost per pole inclusive of the necessary screws, and scrawled the measurements I gave him onto a dirty slip of paper. The one caveat, I insisted, was that the bottom of the poles consisted of a flat panel rather than a thick block, so that it would be easy for me to affix them to whatever I needed. He understood. I believed so because he nodded his head, repeated what I said a couple of times, and said in vernacular that he had understood. Then we agreed on delivery two days later, I paid up, and walked back home. For two days I planned my mission carefully so that I would send the children off on some jaunt, then have the poles installed and nets draped so they would return to surprisingly refreshed nets of protection from mosquitoes. I even converted a couple of Christmas Light strings into decorative accessories by printing out nice little pictures of their favourite things and cello-taping them over the lights so they would glow above the nets. On the appointed day, I was back at the workshop to pick up my bed poles, a little more excited than normally necessary, only to find that I had caught Issa quite unawares. “Haaaa, boss!” he began, and my heart sunk. Cutting him to the short story, I discovered that he had finished the poles but there was a small problem. “Mbitutte kku machine e Luzira!” (I have taken them to the machine in Luzira!). Not being a carpenter, my interrogation into this machine was useless and I left with a promise that the poles would be ready the next day; and for four days I kept stopping by to be told about the machine, if I were lucky enough to catch Issa there. One time I suspected he had seen me and ducked, judging by the looks of the other people at the workshop. Eventually, I took time off to conduct a stake-out and accosted him. A little flustered, he recovered quickly enough to withstand a stern lecture about the need for seriousness, and then presented the bed poles but there was another problem. “Sukulyu zibuze!” (The screws cannot be found). At this point I was happy to have the neatly made bed poles without the screws but then a young fellow nearby who had been watching all this walked up and asked what the problem was. Cautiously worried that his politeness was a con, I hesitated a little but he then told me he was the owner of the workshop and could not stand the idea that I was an unhappy customer. My startling discoveries began there – this roadside workshop was not just a shack with piles of neatly organised timber! This proprietor, Yunus Kizito, explained the set up and how chaps like Issa are hired carpenters who also do work on the side, such as mine, but essentially work for Yunus and his outfit. Angry at the poor customer service, he tongue-lashed Issa afresh and sent him off to find me my screws at no extra cost, whence I discovered more – the ‘machine’ that Issa had taken the poles to Luzira for was a drill. Just that – a drill; the same type I had at home for personal use. One I had bought at the Game store at little over Ushs100,000. Disturbed that a workshop such as his lacked basic equipment, I quizzed further and he pointed right across the road at a furniture showroom full of imported pieces, explaining that there was no way he could accumulate the savings needed to invest when THAT neighbouring establishment was in business. And yet, he revealed, a lot of that ‘imported’ furniture was actually made right here in Yunus’ roadside carpentry, for which he gets paid a fraction for his work! I unleashed lugezi-gezi telling him to professionalise, regularise and get an investor and what not so he competes. In turn he showed me his business documents and receipts (no mis-spellings), and explained that the banks had rejected his request for a capital injection of Ushs2million for equipment. See, he had no security besides his timber and expertise, and, since he lives in constant fear that his roadside workshop would be raided by other authorities, no address to register. All very valid – which is why I felt the need to invest. We would train Issa in customer service (he was fired before I left that evening), use my address for the bank loan, and then raise a locally manufactured challenge to the imported furniture businesses. Plus: we already have a ‘machine’ – my electric drill at home. THIS week I am providing a free but highly lucrative lead for the youth of Uganda seeking economic emancipation and finding frustration in pursuits a la “Tusaba Gavumenti Etuyambe”. This is my contribution to the International Youth Day celebrations that have had President Yoweri Museveni these weeks past touring parts of the country meeting youths of different persuasions and dispensations. Never mind that the official International Youth Day fell on August 12; Uganda has the world’s largest population percentage of youth and therefore we should be allowed some leeway in celebrating the whippersnappers for longer than just that one day. Ignore, also, the fact that this year’s global theme of the day was “Youth and Mental Health” – that had nothing to do with us. We have focused on youth empowerment instead, which is much more urgent for our situation, and more relevant to our needs; and if anything, the one factor that probably affects the mental health of our youth here might be poverty – otherwise how would you explain the emergence of the ‘National Association of the Unemployed’? Yes! The National Association of the Unemployed (NOU) is a genuinely existing organisation with structures consisting of “former students who are unemployed”, as one news story put it. This begs another treatise, to be delivered later, about how useless our education system in Uganda really is since we produce graduates who loudly and publicly believe that they spent twenty years ‘studying’ in order to be given jobs, rather than to apply themselves at solving problems, and changing society for the better. On Tuesday this week I found myself in Wakiso District for the International Youth Day celebrations, as early as half past nine. Knowing full well that the Guest of Honour, the President himself, would likely not be there on the dot of any hour suggested as the time they expected him there, my posse and I stopped for breakfast at a roadside eatery named ‘Askarrah’ or something. The lanky, heavily-vaselined (or was that Samona?) lady running the two-table, four-bench joint served us up tasty plates of steaming hot food, tea and coffee as we displaced two earlier patrons; she laughed when we asked her if she was going for the event to join thousands of others streaming past to get to the District Headquarters building on time. She waved us off politely and I felt a little guilty at not tipping her but I knew that she would have chased us down to take our change with us, so we left her there peering at us through the doorway curtain, ignoring everybody who was walking past and making no attempt to opportunity into her eating joint. Six hours later I thought about her again; not as an individual, which my wife would certainly not approve of, but her food and how if she had followed us with her two tables, four benches, sigiris and her kitchen team of perhaps just herself, she would have made a killing and we would not be suffering such pangs of gastronomic nostalgia! The one person who was making that killing was a fellow with a basket filled with small packs of plastic bags containing roasted groundnuts and sim-sim, which disappeared quickly in exchange for hard cash. By the time the event ended, in the evening, we had been served a bottle of water or soda each – and I can’t speak for everyone there. THIS IS OPPORTUNITY! Going by the media reports alone, the President probably addresses such gatherings and events about ten times a month, with massive numbers of euphoric attendants all dutifully gathered in place and kept in throngs by an attentive ring of stern security personnel. That’s called a captive market. The groups there normally include people such as myself, as well as other better-heeled members of society who always find reason to be in the vicinity of the President. In fact, there are some in that market who are always seeking political capital and could buy up a whole van of food to feed the thousands in order to impress them! The Association of the Unemployed, and any other youth who is in need of profit, should simply turn all their efforts to providing mobile catering for these gatherings and, judging from the manner in which we snatched up those groundnuts and sim-sim packets, WE WILL PAY energetically! It is amazing how much opportunity we let go by us yet it is obvious and ready. That day, the only people who really made those hours count profitably were the singers who went centre-stage before the President arrived and got thrown tips (okufuuwa), and the people selling NRM paraphernalia at the entrance, who long ago worked out that you can’t go wrong with the colour yellow at any state event. Whereas the singers probably made enough money to pay their boda-boda or taxi fare or fuel costs back home, one of them literally had to go smiling to the bank because he even got kufuuwad by cheque – and Ushs1million at that! 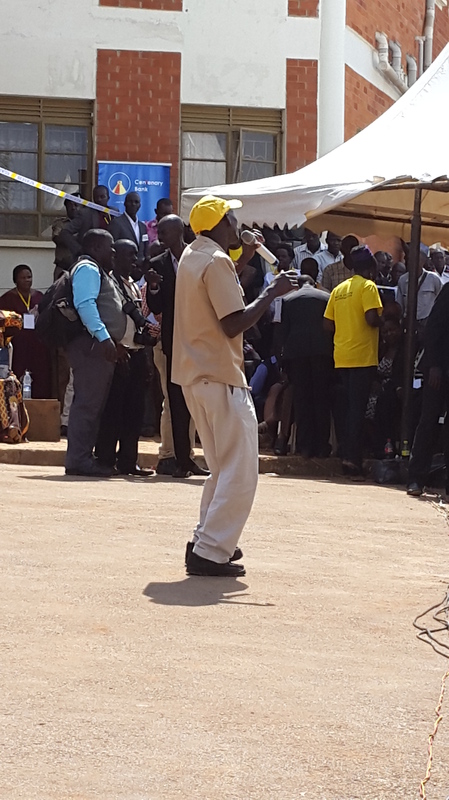 The chap, Hassan Tyaba (I think) was the lousiest looking of the lot that day, pitifully compared to the curvaceous and brightly-coloured Julie Angume and heavily-anchored Catherine Kusaasira, but one stanza into his vernacular, Ugandanised iliad the audience was on its feet. He sung the story of the NRA/M and praises to the President that were miles apart from the “Museveni Abeewo” chorus the rest had taken on, and delivered such prose and meaning that he was forced back about fifteen times and attracted the Ushs1million cheque, US$500 in cash (yes – US Dollars) and perhaps another million in loose notes. But then, we discovered, he was quite puzzled about what to do with the cheque because he did not have a bank account! And as Youth MP Patrick Nakabaale got about trying to hook the young man up with modernity, I observed that Centenary Bank had a banner erected right there in front of everyone…but this opportunity was clearly going right past them. Which then made me wonder: why don’t commercial banks and FMCGs and training institutions and sellers of agricultural inputs and equipment and more business people follow the President around to set up sales marketing kiosks wherever he has these thousands of people gathered, free of charge? We all know that the crowds get to wait hours before the President ever shows up, so why don’t we take our commercial road shows there and turn opportunity into profitable reality? Wouldn’t that achieve even his own objective without having to hear “Tusaba Gavumenti Etuyambe”, and still deliver the kudos to him from both the commercial entities taking opportunity, and the people benefitting?